The Commoner in Pittsburgh is a stylish gastropub that serves farm-to-table fares with a British hint along with draft beer, cocktails, and wine. Founded by Chef Wyatt Lash in 2015, the gastropub's menu highlights ingredients from the surrounding farms. The restaurant specials and events include Bloody Mary Sundays, The Commoner Corner loyalty program, and nightly caffè corretto or espresso corretto. The Commoner Corner is a five-seat counter and sidewalk-facing quick-service window that serves breakfast and lunch for Pittsburghers on the go. The menu list offers easy-to-eat fares that are ideal to eat on the run. Patrons get to pick fresh-baked pastries and croissant sandwiches during breakfast and hot sandwiches that use house-smoked, hand-crafted meats or fresh veggies during lunch. Beverages include smoothies, fresh-pressed juice, milkshakes, and premium Caffé Vita coffee. The Commoner Corner is open Monday through Friday from 7:30am to 2:30pm for breakfast and from 11:00am to 2:30pm for lunch. Biergarten is The Commoner's rooftop open air venue located at Kimpton Hotel Monaco, 620 William Penn Place, Pittsburgh. 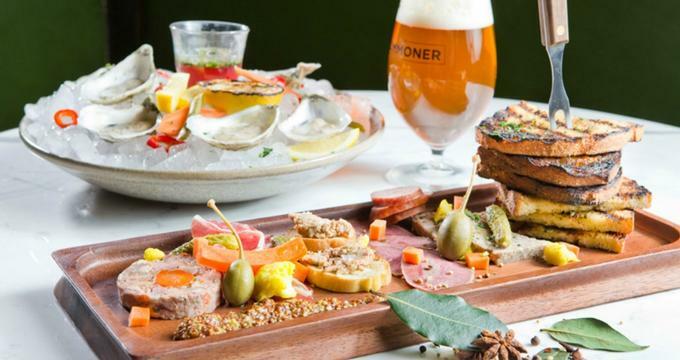 The Biergarten offers a large variety of rare European beers coupled with German-influenced bar bites by Executive Chef Wyatt Lash. It is a popular after-work and weekend gathering spot frequented for its list of European beers, handcrafted cocktails, punches, and rooftop experience. Guests also get to enjoy playing life-size Jenga, corn hole, garden chess, and a large-sized Connect Four. Ø Breakfast - Monday through Friday from 6:30am to 10:30am. Ø Lunch - Monday through Friday from 11:00am to 3:00pm. Ø Brunch - Saturdays and Sundays from 7:30am to 3:00pm. Ø Dinner - Monday through Thursday from 4:00pm to 11:00pm, Fridays and Saturdays from 4:00pm to 12:00am, and Sundays from 4:00pm to 10:00pm. Ø Bar - Monday through Thursday from 10:00am to 12:00am, Fridays and Saturdays from 10:00am to 2:00am, and on Sundays from 10:00am to 11:00pm. Ø Happy Hour - Monday through Thursday from 11:00pm to 1:00am. · Dinner - Nibbles, salads, cuts, daily inspirations, and uncommon classics like the Commoner Burger, tikka masala, buffalo cottage pie, steak and potato, and fish sandwich. · Lunch - Nibbles, salads, “stuff on bread,” and daily inspirations like quiche and game burger. · Brunch - Seasonal fruit plate, omelet, pancake, Benedict, salads, burger, sandwich, and sips. · Breakfast - Croissant, oatmeal, granola parfait, smoked salmon, seasonal fruit plate, omelet, buckwheat pancakes, sides, and sips. · Dessert - Sticky toffee pudding, Nutella mousse, black sesame ice cream, s’mores, cheddar board, and seasonal ice cream. · Beverages - Signature cocktails?, and classic cocktails?. · Bar Menu - Hummus, Scotch egg, spring onion soup, Brussels sprouts, The Commoner salad, butter lettuce salad, the Commoner Burger, tikka masala, and beef tartare. · Common Hours - sips, bartender's choice, and nibbles like Brussels gratin, game burger, fried chicken sandwich, the Commoner Burger, and short rib mac and cheese. The Commoner offers online reservations in partnership with OpenTable reservations. Online reservation can be made for up to 6 guests, and parties larger than 6 people are asked to call the restaurant to make dine-in reservations.